Heavy metals in industrial wastes do worldwide significantly influence surface waters, soils, and human health. 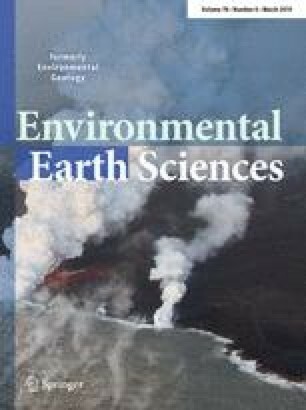 The relationships between geochemical stream sediment composition and industrial pollution by phosphate mud flood were examined to assess the severity level of the heavy metal contamination due to the mining activities in the Gafsa-Metlaoui basin (Tunisia). A statistical approach based on linear correlations and principal components analysis of 8 metal contents was used in stream sediment, which was applied to 21 samples of surveyed Metlaoui stream. Within the final model, four Eigen factors did explain almost 90% of the total variance matrix (F1: 42.25%, F2: 19.60%, F3: 15.50 and F4: 10.15%). Three main metal associations were found in the Metlaoui stream sediment. The first was concerned with Titanium (Ti) and Zirconium (Zr) as conservative elements. The second related to the important role of Manganese (Mn) with Iron (Fe) hydroxides in fixing metals. Finally, the third one consisting of Zinc (Zn), Nickel (Ni), Copper (Cu) and Molybdenum (Mo) is all known to be linked to local mining activities sources. The overall degree of contamination was in the following order (high to low): Ti > Zr > Zn > Mo > Mn > Ni > Fe > Cu, but the extent of the contamination did decrease downstream from the mining activity. Phosphate mining activity, especially washing phosphate, leads to an unwanted heavy metals contamination in the nearby surrounding environment. The authors are thankful to Agrosphere Institute (IBG-3), Forschungszentrum Jülich GmbH and the Division Soil Science, Institute of Crop Science and Resource Conservation (INRES) University of Bonn (Germany). The authors wish to thank all the staff of these two institutions.